This straightener looks amazing!! I really do love how it is a combination of a brush and flat iron - so genius! I've read so many articles on this and this looks like a fabulous product! 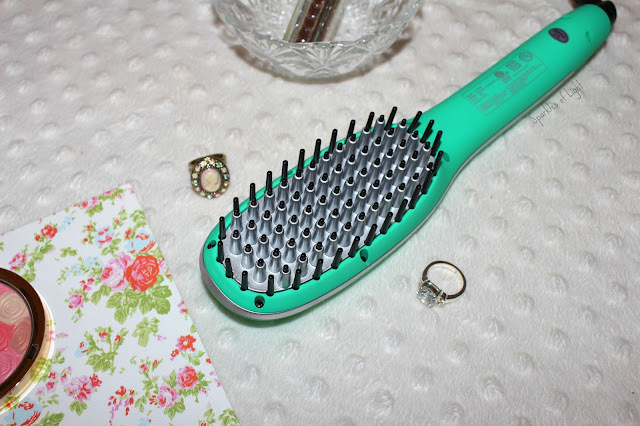 I've never used a straitening brush before - looks really interesting! I have tried the hair accessories from Irresistible Me which are lovely! I didn't know that this product was out there. I love my Irresistible Me curling wand and need to check out this brush! This looks like a life saver! My hair is naturally straight but I always sleep with it up in a bun. When I take it down the next day it's a right mess, so this brush would be perfect to quickly get it back in check! Same here, my hair is a disgrace in the morning! These look incredible!! Im so lazy with straightening my hair, such a chore! I agree, I hate doing it haha. I agree, too straight looks a little off. Looks like it worked really nicely, although it wasn't "poker straight" as you say. Great review anyway!!!! This looks so amazing! Need to give it a try! I´m so intrigued by these brush straighteners! I somehow can´t believe how they´d actually straighten your hair. Maybe that´s because I have the worlds straightest hair normally, so straighteners only do a minor thing on me. But from the pictures, it did a great job! I think it looks way more natural to not have it poker straight. Also congrats to your toddler for taking the pictures, they definitely do not look like they´ve been taken by a toddler! I know, I've trained her well haha. This looks like an amazing product! 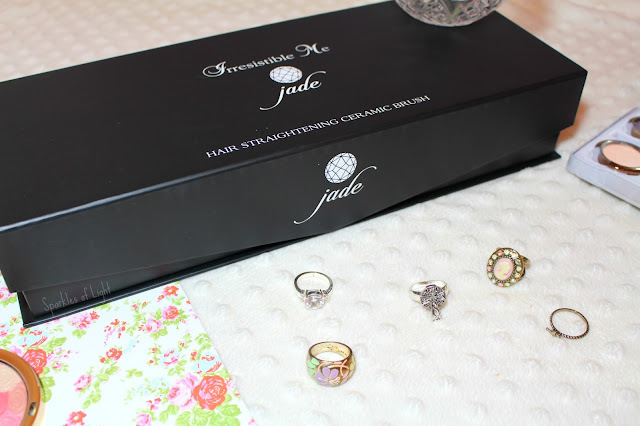 I have tried and reviewed their flat iron and it's amazing! Great quality and definitely value for money! Thanks for sharing Rosy and have a great week! I've seen brushes like this but I've always been hesitant about trying them out! Not that I have much of a reason to begin with either as my hair is relatively straight already. I am pleasantly surprised that it worked so well though! I actually love how natural your hair look with the brush. I'm not a fan of the poker straight hair that you get from a straightening iron so this really interest me. Same here, I don't suit my hair too straight. this brush is so interesting! Sounds like a great product! It worked so well on you. Thanks for sharing! I wanted to try their hair extensions but my hair is a weird colour and I can never seem to find extensions that match. sounds great i have to try! ur hair looks so gorgeous! Wow that's pretty impressive. Wi;; have to try it. Oh wow! I didn't even know things like this existed. Pretty great invention, however I'm a bit worried about the healthiness of your hair? Because it must be pretty intense in order to have such a great result, no? This sounds like such an awesome idea! I've never heard of a straightening brush but it looks like it does a great job! 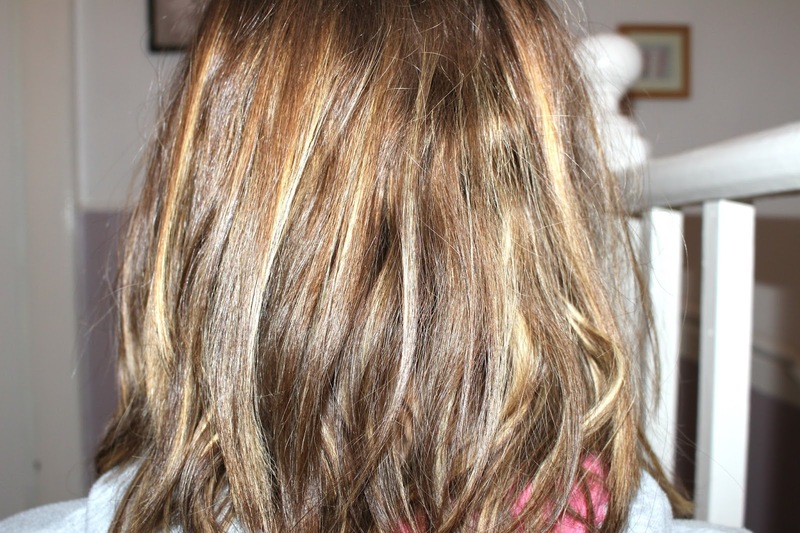 This is such a gorgeous post – your hair is stunning! I really like the finish this brush gives as I'm not one for poker straight hair, and it still looks healthy and smooth. Definitely wouldn't have thought it would give this good a result! I know, I wouldn't have expected it either! Oh wow this is such a cool tool! My hair is super curly, so I would be interested to see how it would react to this. 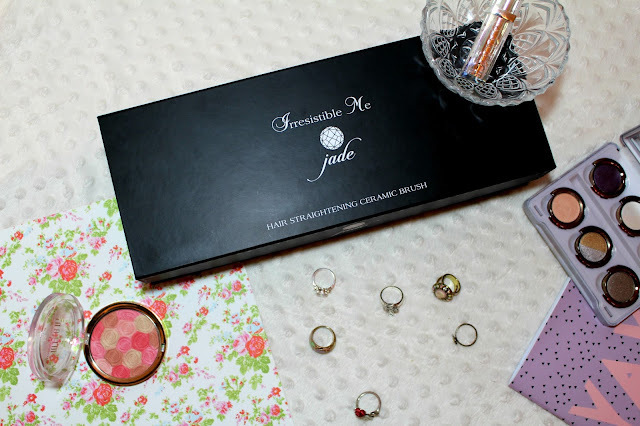 I love Irresistible Me products! What a pretty result! Thanks for sharing this, lady! The results are amazing! Awesome product. I just tried some extensions from them and love them. This brush straighter seems so cool ! My hair is kinda naturally wavy, so this brush seems magical! Also is that the wizard of oz palette ? What a great looking product, your hair looks amazing! Even though the results aren't super stick straight like with a straightener, I like the soft natural effect of it. It looks so smooth and nice! This is such a cool idea for it to be in a brush form rather than the traditional style. I agree, it makes styling easier. Great post lovely. I tried their hair extensions and really loved the quality. Nice brand and loved your detailed post. I've never believed that these brushes actually work but your hair looks awesome!! I've been wanting to try something like this because it sounds so interesting! I've seen this around and it looks like a great product! I had heard of them in passing but I always wrote them off because I was scared it would burn me !But they sound absolutely wonderful and I adore the colour ! Love this hair tool. Please check out my ultimate guide to visiting a hairdresser! Your hair looks great! Definitely need to try this! 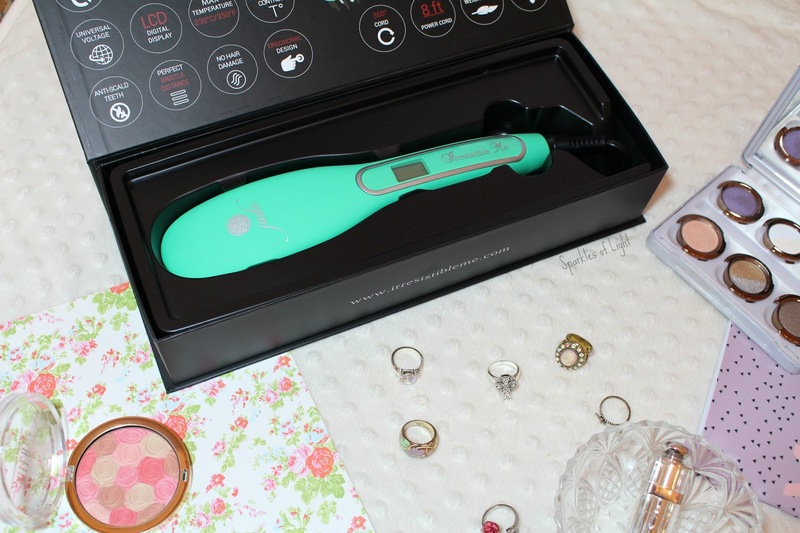 I have the Irresistible Me flat iron and I love it! Just like you I only used my GHD before so I was curious about what it could do for me (I have really curly hair) and I was surprised by the excellent results. I especially like the fact that you can adjust the temperature. Irresistible Me sent me some of their hair extensions and their products are really good! So beautiful! And those rings are too cute! In love with your hair brush! I've seen these about a lot recently. I love the concept behind the and how easy they are to use. Great review!Your hair looks beautiful! This looks amazing! I need to try this asap. Thanks for sharing! I think it did a good enough job, I have the JML version but I don't get on with it too well as my hair is so thick. Wow seems cool! Thanks for sharing! Wow looks great! I've tried their hair extensions and was really impressed! Haven't heard of this before, but looks great! It makes your hair look so much smoother but still with loads of volume! Wow, such a huge difference. The results look amazing! Wow it actually did such a good job! I'll definitely need to check this out! Love the outcome of using this brush. You hair looks super nice. WOW! Girl your hair looks fab and there's definitely a noticeable difference! I also think this looks way more natural too, love it! I have their flat iron and it's awesome. So I'm sure this one's great too! wow! looks like a good product! hahahahaha....i'm sure your mom understands. I have used Irresistible products before and to be honest i was really really impressed with their hair extensions, no shedding no tangles. I see the straightening iron is also a good deal as the results in these pictures speaks for themselves. Great post. This brush seems great! Loving the result. I didn't know this brand. Thanks for sharing with us! I've never heard of this brand before, but the product sounds lovely! Great review! The final effect on your hair is wonderful! I don't know why but I still don't want to trust these brushes.. This one looks doing it's job though! haha. It did a great job! Your hair looks great. I have heard of Irresistable Me. They make great products from the reviews I've read on blogs and youtube videos. I haven’t used that one but I have used a similar one on my mother. I think they are a great tool when you just want to slightly straighten your hair but don’t have time to use the straighteners. I would think that this brush might not be so hard on your hair as an iron can be!! Plus definitely less time consuming---great result! Wow love the colour. I definitely need to try this out! This looks like such a good alternative to straightening irons. Looks like you get more of a salon blow-dry effect with it and that's not something to complain about. Wow, this product looks amazing! I definitely want to check it out! Thanks for sharing! I recently tried this brush too, it took a bit of getting used to but I quite like it! This looks so interesting! i have to try it. I have tried the 'Irrestible Me' flat iron and loved it and this looks like another amazing product! 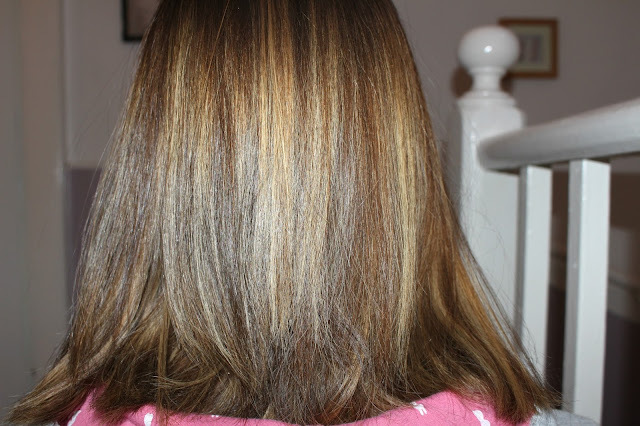 I love the end result and a brush must be easier and quicker to use! I really want to try this. At first i was so skeptical but hearing it's actually pretty good makes me want to try it out and hopefully it will help me not be lazy at putting -10000 effort into my hair haha. I like may hair wavy but I love that it takes out the frizz. Ha when I was visiting Paris I blew out the circuit breaker and there was a small explosion and the distinct smell of smoke. I had an adapter but not a convertor lol.